Renaissance reached Venice relatively late, maybe due to a strain of conservatism in the Venetian character or to the perennial local desire for rich and elaborate surface ornamentation. The church of San Zaccaria is the ideal place in which to observe the emergence of the Venetian Renaissance style in architecture and painting and the transition from Gothic to Renaissance. 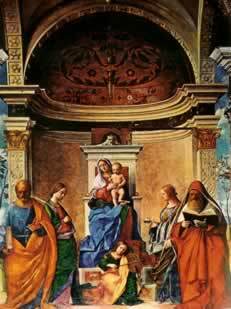 We will see one of the most celebrated altarpiece by Giovanni Bellini, the father of Venetian Renaissance painting. 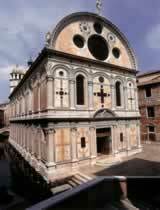 We will then reach the ancient seat of the Schiavoni	(Slavs or Dalmatian) community in Venice. The Schiavoni were Dalmatian merchants who formed an active trading colony in Venice and in 1451 built their own confraternity close to the Riva degli Schiavoni, where they moored their vessels. Their tiny scuola contains one of the most irresistibly appealing sequences of pictures to be found in Venice, executed by Carpaccio, the most popular story-telling painter of the 15thC, who used to depict an imaginative early Renaissance Venice, where scenes combine fantasy and reality, and architectures present a peculiar style that we will see materializing in the small, exquisitely-crafted Church dei Miracoli, built at the end of the 1400s to contain a miracle-working image of the Virgin Mary. Clad in sheets of softly-colored marbles, it seems both quintessentially Venetian and not quite real. It was described as second only to San Marco shortly after it was built, and has remained one of the most loved and admired of all Venetian buildings ever since.